Prime minister Sheikh Hasina inaugurated the combined Military Hardware Exhibition on Sunday coinciding with the Independence Day and National Day at the National Parade Square. Bangladesh Army, Navy and Air Force exhibit their hardware including weapons in the weeklong display which the Prime Minister opened by cutting a ribbon and releasing balloons this afternoon. A spectacular fly-past by six air force warplanes and successful landing of armed forces paratroopers from military helicopter marked the ceremony at the scene. Sheikh Hasina went round different stalls and pavilions set up by the three forces and witnessed various light and heavy weapons being used by the army, navy and air force troops when concerned officials briefed her on the hardware. Four of the stalls were specially designed to portray the armed forces contributions and bravery in 1971, their modernization in the past 10 years of Awami League government and role in UN blue helmet missions in different parts of the world. 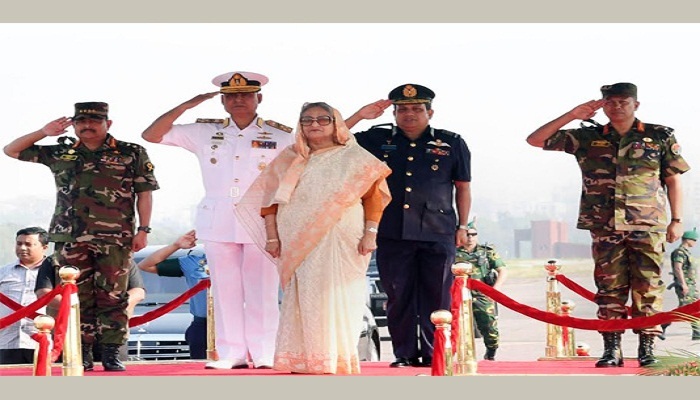 Army Chief General Aziz Ahmed, Navy Chief Admiral AMMM Aurangzeb Chowdhury, Air Chief Marshal Masihuzzaman Serniabat and Principal Staff Officer (PSO) of the Armed Forces Division Lieutenant General Md Mahfuzur Rahman earlier received the premier as she reached the National Parade Square. Cabinet members, premier’s advisers, parliament members, secretaries, foreign ambassadors, senior civil and military officials were present on the occasion. The premier and the guests also witnessed a cultural programme performed as well by artistes of Swadhin Bangla Betar Kendra while she later joined a photo session with them. An ISPR press release, meanwhile, said the display would be opened for all from 9.30 am to 5.30 pm from March 26 to March 31. According to the schedule, the exhibition is set to entertain particularly students of school and colleges in the capital from 12 noon to 5.30 pm on March 30. The display is expected to draw on its last day on March 31 the family members of armed forces personnel and students of the schools and colleges run by the three forces from 12 noon to 5:30 pm.